Friday was the last day at school before spring break, and oh my, did that put me in a good mood. I dressed for spring on the bottom and winter on top, and rode to the station with chilly legs and a sweaty back–oh well, what are you gonna do? It was a quick zip around campus for errands and one last meeting, and then I was zipping back to the station to meet the train for a much-needed break from all this commuting nonsense. I took my left onto the outer circle and ran into another Brompton, this one ridden by A., who teaches in the Information Systems department. I sidled up next to her for the ride, and we shared our glee at having a whole week off to catch up on all the work that’s been piling up in the first half of the semester. It turns out we both use that bank clock to tell the temperature on our way into campus and the time on our way out. She usually goes up the bride, while I take the elevator and bridge over to the other side. I thanked her for talking me into getting the monthly MARC pass, and she kindly offered to walk me through getting my first Zip Car, which was what I was heading back to Baltimore to do. I generally prefer riding alone–I’m antisocial like that–but commuting with A. is a treat, because it’s just always nice to know you’re not the only one who is secretly judging all the newbie riders who don’t have their tickets out. And then I took Brompty for her first ride in a Zip Car and home again, a quick stop to toast the holiday before folding her up and carrying her up the stairs so I can give her a bath and let her rest for the week. Ah, commuter love, tis a beautiful thing. 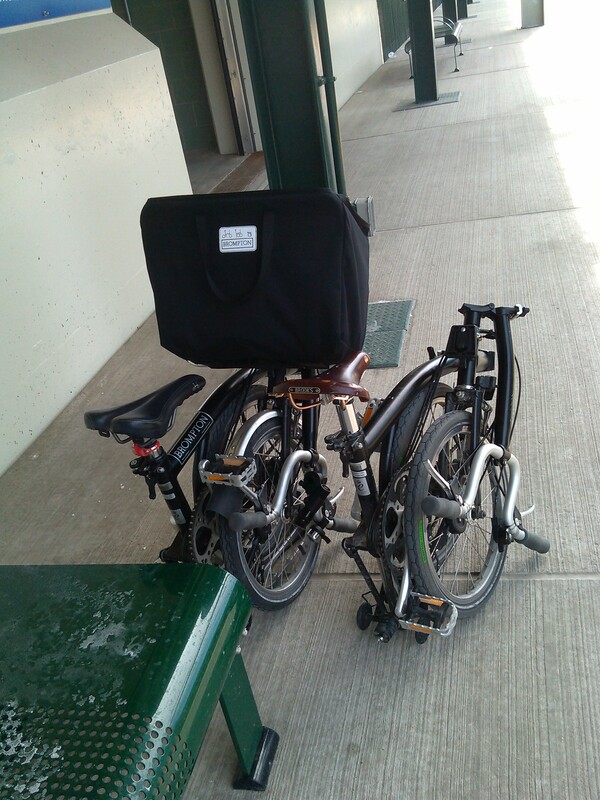 This entry was posted in commuting and tagged Brompton, commuting, Halethorpe, Spring Break. Bookmark the permalink.